I was asked to write an article that addressed how to conquer clutter and set up a schedule when someone has a chronic illness that limits his or her abilities. After chatting with the person a bit I wrote this article. First I’d like to say that many people do not understand some chronic illnesses, yet alone ones that are invisible. Some illnesses such as Lupus, Fibromyalgia, Rheumatoid Arthritis, Crohn’s Disease, mental illness, brain disorders, and many, many more are usually only felt by the person who has it, and sometimes, also by the family they live with. It’s difficult for others to relate to fatigue or exhaustion of their friends or loved one if they “look” fine. The way to conquer clutter when you face chronic illness that limits your energy is by refocusing your brain to look at clutter in tiny, bite size pieces. Unfortunately many of us look at clutter and other messes as a whole… a HUGE daunting task that seems too large to tackle. Have you ever put together a large jigsaw puzzle? The first thing you do is to look for the edges to frame the outside. Then you look for like-colored pieces that might be in the same grouping or area of the puzzle. If you can look at how you handle your daily tasks in the same way it will make it easier to get through the day. 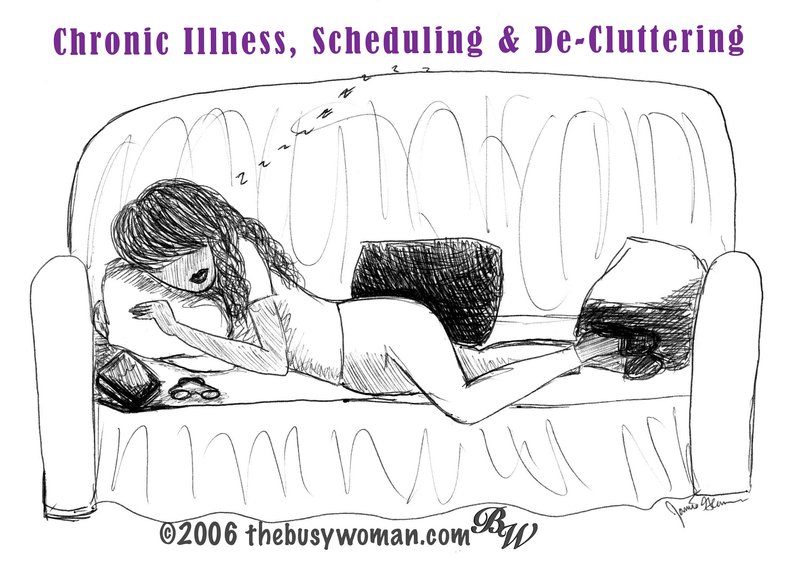 Setting up a schedule when you have a chronic illness can be done in limited quantities. You can schedule anything you want from meal times to opera outings. However, at any given time you might not be up to following through with your plans due to a flare up or loss of energy. As long as you prepare for the possibility of not being able to stick to plans you make in advance, you can do it. Make sure friends and family know of your illness. If they know about it, they will be more understanding. Let family and friends know when you have a need. Have a back up plan and discuss it with others in advance. Example 1: You purchase tickets to a show and call some friends to see if one of them can go in your place if you’re not feeling well enough to go out. Example 2: You make dinner reservations and let the person or people you’re going with know that if you have a flare up or lose your energy, you might have to cancel. If a good friend is going with you, they might opt to bring dinner in so you can enjoy it too. But you need to ask. Otherwise, they might not think of it on their own. When you make an appointment, let the business know that you have a limiting illness that could cause you to have to cancel. Normally in this situation, they won’t charge you for a missed appointment. Set up the car for when you’re out and need to rest. Bring a pillow and blanket too. Having a car kit with all of the necessities you’ll need to rest comfortably makes a big difference. I know from experience. One key to conquering clutter when you have a chronic illness that only affords mini spurts of energy is to only plan 5 – 15 minute increments to clean or clear clutter. Pick only one tiny area to work on at any given time. Stick to that one area until the job is done. Example: One day, I went into the office early and set aside 15 minutes to work on a task. I spent about 12 minutes cleaning out the shredder, funny as it may sound. No one emptied it and it got jammed. Then I had a few extra minutes to empty the trash. I was able to accomplish two important tasks in 15 minutes of time. These may seem like tiny things, but to me they’re proud accomplishments because they needed to be done. It’s the same with your clutter. Pick one pile of paper or one cluttered spot to work on at a time. Let’s look at a home office as an example. Take everything that is out of place and put it in a pile on the floor. If you can look at the pile and know exactly where some of the items go, put them there. Put categorized boxes in the middle of the floor labeled: urgent, file, give away, and trash. I sometimes have a stray pile called “not sure,” but that’s only if you can limit it to the extreme. Take out the trash. This offers instant gratification, as there is less mess in the room. Put the urgent box where you can get to it as soon as possible. Put the other boxes aside for your next energy spurt. Make sure it’s a comfortable area to work in and that you can leave everything there until you’re able to finish. Set up everything the way you want it on the desk and around the office. This is, “almost instant gratification.” It’s what helps women who are Type B’s move forward. Spend short spurts of time going through and filing your papers, when you have the energy. Note: Start by using Post-it® notes as your labels, by writing on those first. After all of your files are labeled and all papers filed inside, put them aside. Make formal labels and put them in alphabetical order. Put the labels on “new” file folders, then transfer the ones from the files with the Post-it® notes to the new file folders, so everything is in alphabetical order or the order you choose. File things where you’ll easily be able to find what you’re looking for. There are several illnesses that cause major fatigue (robbing a person of their energy), limit activity, and keep them from being as productive as they need or want to be. Many of these illnesses are invisible, so people who aren’t familiar with an invisible illness either don’t believe that they are real or don’t understand when someone is too fatigued to continue on an outing. If you know of someone who suffers from a chronic illness, it would be a blessing to them if you volunteered to help or just visited, even if it’s just once a month. There is always a need. If you can’t do that, please send them a card or note. They need to feel the love of others and that they are still somehow connected.